24th February marks the beginning of Fairtrade Fortnight – two weeks of the year where we’re all encouraged to think about, and buy, Fairtrade. Donna Simpson, from the Fairtrade Foundation, shares with us why, after 20 years of the FAIRTRADE mark, it is now more important than ever. It’s hard to believe, but this year the FAIRTRADE Mark will have been on UK shelves for two decades – 20 years since the Fairtrade Foundation certified its first bar of chocolate, jar of coffee and box of teabags. But for those who don’t know much about Fairtrade, is it still important, and is it even relevant to The Boys’ Brigade? The answer is absolutely, yes. The Fairtrade Foundation was established in 1992 with an aim to make trade fairer: to make sure the millions of smallholder farmers who produce our food get a fairer price for the work they do. To make sure they are not exploited, have better working conditions and earn a bit more – which is at least enough to put food on the table, give their children an education and shelter, and have the opportunity to access medical care – for many of those who produce the food we eat, this is still not the case. By having the FAIRTRADE Mark on a product, the farmers get a fair price, as well as a premium – a mandatory amount above the cost of production, which the producers themselves decide how to spend. The premium is often invested in farm improvements, education and healthcare projects: everything from new machinery to ensure a greater yield, to building boreholes for running water, health centres and schools for the community. So why is Fairtrade important to us in the UK? Well, did you know that 500 million smallholder farmers produce 70% of the world’s food? And yet, those farmers currently make up half of the world’s hungry people? 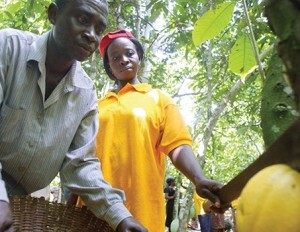 Without these smallholder farmers we wouldn’t have many of the products we love, like chocolate, bananas, tea and coffee. This Fairtrade Fortnight (24 February – 9 March), you can get your Company involved and help educate others about how Fairtrade helps these smallholder farmers, and the difference it makes to their lives. What can you do for Fairtrade? Fairtrade Fortnight 2014 is all about bananas – the UK’s favourite fruit and one which has been at the heart of Fairtrade since we first began certifying bananas in 2000. In the last 10 years, the shelf-price of loose bananas has almost halved, while the cost of producing bananas has doubled, trapping many of the farmers and workers who produce them in a cycle of poverty. In fact we now pay on average 11p for a loose tropical banana compared to 20p for a loose UK grown apple. 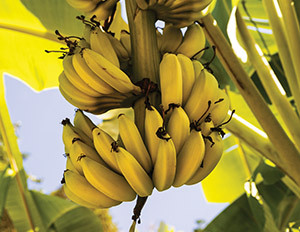 Whilst Fairtrade provides a vital safety net for some banana farmers and workers, the majority still suffer. This cannot continue. We want to make all bananas fair, and by raising awareness of Fairtrade you can help achieve this too. Fairtrade Fortnight is a campaign to ‘Abolish the Unfair Banana’ and is the next part of our three year initiative to Make Food Fair.